SYNOPSIS - In Northern Genabackis, a raiding party of savage tribal warriors descends from the mountains into the southern flatlands. Their intention is to wreck havoc amongst the despised lowlanders, but for the one named Karsa Orlong it makes the beginning of what will prove to be an extraordinary destiny. Some years later, it is the aftermath of the Chain of Dogs. Tavore, the Adjunct to the Empress, has arrived in the last remaining Malazan stronghold of Seven Cities. New to command, she must hone twelve thousand soldiers, mostly raw recruits but for a handful of veterans of Coltaine's legendary march, into a force capable of challenging the massed hordes of Sha'ik's Whirlwind, who lie in wait in the heart of the Holy Desert. But waiting is never easy. The seer's warlords are locked in a power struggle that threatens the very soul of the rebellion, while Sha'ik herself suffers, haunted by the knowledge of her nemesis : her own sister, Tavore. Bear with me because this is going to be emotional. In the last book, Memories of Ice, we see one of the most beloved characters Whiskeyjack being killed. That and the last remaining squad of the Bridgeburners almost destroyed. For their unflinching bravery and service to the Empire, Dujek One-Arm disbanded and the surviving members. House of Chains begins with the tribe of Teblor. The Teblors are a savage race of barbarians who worship their own 7 Gods. And they have no idea that they are being used by the Crippled God for his own purposes. The Teblor Gods need someone to lead all of Teblor and the pawn they've chosen is Karsa. Yes, its the same Karsa who will one day become the protector of the Sha'ik in the very heart of Raruku. Remember the huge Toblakai the old Sha'ik had as a bodyguard in the second book? This book begins with his journey before he becomes a friend of Felisin, the Sha'ik reborn. But this book is more than that. Because Felisin's sister, Adjunct Tavore is readying herself for battle against the Whirlwind. And poor Tavore has no idea that the enemy she will face is her little sister. Meanwhile Fiddler, previously a Bridgeburner, has re-enlisted himself in the Malazan and finds himself as the sergeant of a squad of Malazan soldiers. And when the death of Whiskeyjack and his beloved comrades reaches his ears, the scene is unbelievable. That has to be one of the most devastating moments of the book. Watching Fiddler come in terms with their deaths drove me to tears. Elsewhere, not everything is peachy in the Sha'ik's camp. Her mages are plotting against her and Felisin cannot do much because she needs their help to defeat the Malazans. Heboric, himself is coming to terms with his God. The Toblakai has plans of his own and Felisin's inner circle are circling like a hawk to pounce on her should the Whirlwind falter. If you thought Steven Erikson was done introducing new characters, think again. There are 6 more books left and he has managed to kill the best of the characters while continuing to introduce a lot more. 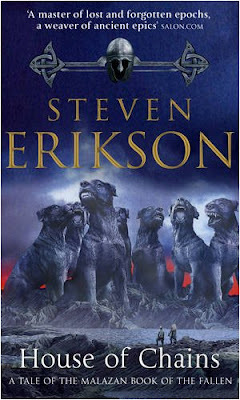 Erikson has this ability to write novels that looks like they do not continue from the next book. Only a part of the long storyline continues and a few characters are repeated and yet you can feel it in your bones that it will all come together. Soon. The much awaited battle simply blows you away. The Malazan soldiers face a huge army and tactics might be the only thing to save them. That, and the crazy sappers who likes to blow things up. And then the surprise package comes to their aid. The Bridgeburners have Ascended. Yes, the entire Company has ascended and reached God-level. And they come back to Raraku where they were formed. With the ghosts of the Malazan dead soldiers on their sides, the tide of battle may just have turned. Meanwhile, The Crippled God is making his own plans. It was another nice review bro. I like the way, u are involved with the characters carved by authors that u choose to read. very rarely people follow that these days. Thanks for the awesome review again.